I remember the first time I walked into a “real gym” as opposed to the one we had in high school. My sister Debi and I had joined a fitness program through a local university. We were in our late 20s/early 30s and as females and non-athletes were in the minority. We were surrounded by bodybuilders, mostly men, who were pumping iron. You might get the idea that we were there for social reasons, but we were serious about getting strong and fit. It was fun, though, to watch them pose (and preen) in front of the mirror, as we struggled to lift our much lighter weights. A trainer taught us how to use all the different weight machines and the free weights. We also had goals we had to meet. One of the highest marks of my success in that program is when I went canoeing with my now husband (not a bodybuilder, by the way) and he mentioned how the muscles in my back and shoulders rippled as I paddled. That was an intensely proud moment! While I don’t know for certain if it was the weight machines or the free weights that built up those muscles, I think it was probably a combination of both. If you follow Catching Health, you know that I’ve been working with strength coach Andy Wight for more than a year. I am not trying to regain my rippling muscles, but I do want to be as strong as possible. Andy doesn’t have any weight machines in his gym but I lift quite a few free weights. Machines only work in what is referred to as one plane of motion. 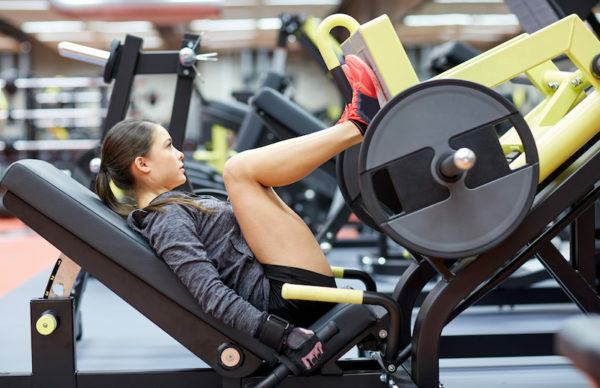 For instance, with a leg press machine, you are working the push away from your body and then controlling the weight back down. There is no need for stabilization from the rest of the body. If you were to do a goblet squat where you hold a dumbbell or a kettlebell as you do a squat, you have to stabilize your upper body as you lower down and come back up. Using another example, a shoulder press machine just focuses on the press going up and control going down. However, when you use dumbbells, as you press up, you get assistance from smaller stabilizing muscles in your shoulder and upper back. They help prevent the weight from moving in an unwanted position. Whether you use free weights or weight machines is a personal choice. Free weights are certainly cheaper and probably more versatile. With either, you have to know what to do and to use proper form. As someone who has struggled with low back pain, I’ve learned how important that is. What’s most important of all — how many times have I said this to myself and all of you? — is to find something you enjoy doing or can or will do and do it! Stay active. I’ll raise my dumbbell to that advice! Don’t miss a thing! Sign up to receive an email when I post something new on Catching Health.